Today I'm going to talk about 12 foods that help you sleep. Because there's no doubt that nutrition can play a major role in how well you sleep. In addition, if you suffer from gas, bloating, constipation, and indigestion...either during the day or late at night...then be sure to see the bottom of this page. You'll discover one little green fruit from New Zealand that can put your digestion back on track. For sleep, the first thing to keep in mind is to never go to bed hungry. Hunger pangs can actually wake you up in the middle of the night. So schedule your bedtime snacks at least an hour before bed. Why? Because one of your objectives is to use sleep foods to boost the production of the amino acid tryptophan, which in turn helps to make the calming neurotransmitter, serotonin. Tryptophan also helps in the production of the sleep-inducing hormone, melatonin. The second thing to keep in mind is that carbohydrates, along with tryptophan containing foods, are the best types of foods that help you sleep. Carbohydrates will raise your insulin levels. As insulin rises, it removes other amino acids that compete with tryptophan in your body. This helps to make more tryptophan available to the brain for the manufacture of serotonin. The third thing you need to know about choosing foods that help you sleep is that magnesium and calcium are two minerals important for restful nights. A great number of people are deficient in both of these nutrients. Magnesium has a calming effect on the body and is also an important building block for melatonin. A deficiency of magnesium can be one of the causes of insomnia. that I call "The Sleepy Dozen"
1. Tart cherries or tart cherry juice. This fruit is one of the very few natural food sources of melatonin. If you're going to drink the juice, be sure to do so well before bedtime so the extra fluid doesn't cause you to wake up for a trip to the bathroom in the middle of the night. One small study showed that people who drank one cup (8 ounces) in the morning and one cup in the evening slept better. These cherries are also excellent sources of vitamin C, which is important for converting tryptophan into serotonin. I've become quite fascinated by the sleep-enhancing promise of tart cherries. So I did even more research on these wonderful little fruits. 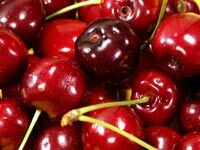 I've written a very detailed article that goes into far more depth about how to use tart cherries for sleep. You can read the article in one of the back issues of my newsletter, Sleep Chat. 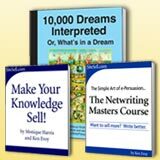 In addition, I have a free report you can instantly download. It's called the Tart Cherry Health Report. Has even more information, as well as several recipes you may want to try. By the way, I do not post all issues of the Sleep Chat ezine. So if you like what you see in the cherry article, at the bottom of the article is a link to my home page where you can then subscribe. Or you can subscribe right now on this page up above to your right. The article is called, Get Your Melatonin for Sleep from Fruit. So click here to read the cherry article and to get the free report. 2. Oatmeal. This is an incredible food. Not only as one of the foods that help you sleep, but also for weight loss and lowering cholesterol too. Oats contain both magnesium and calcium. Oatmeal cookies will work just as well as a bedtime snack. 3. Milk and other dairy products. I personally do not drink animal milk (I prefer almond or soy milk). That said, adding milk to your oatmeal or drinking it with some oatmeal cookies may help you sleep better. Milk products contain tryptophan as well as the stress-reducing nutrient calcium. If milk's not your thing, cottage cheese is also a very good source of tryptophan. 4. Speaking of almonds, they make a wonderful bedtime snack by themselves or as an addition to your oatmeal. They are a rich source of magnesium, which as I mentioned earlier, is a helpful sleep-promoting nutrient. Eat a small handful of these nuts, preferably raw, or have some almond butter on a slice of whole wheat bread. 5. Walnuts. I like to put raw walnuts on my oatmeal. Walnuts contain magnesium and calcium, as well as an abundant amount of tryptophan. Walnuts are also an excellent source of protein that balances out the carbohydrate in the oatmeal. 6. Bananas. This fruit is loaded with tryptophan and is a good source of magnesium. Cut it up and put it in your oatmeal. Or blend a smoothie of milk, banana, blueberries, and a little cinnamon. Or add a banana and nuts to some yogurt, a food that is also a source of tryptophan. 7. Bread. You can't go wrong with a good snack of whole wheat bread and a few slices of cheese before bedtime. 8. Tofu. I've been a vegetarian for 40 years, so I eat some soy foods, which is what tofu is. Tofu is a rich source of high-quality protein, and depending on how it's made, usually contains a significant amount of calcium. A tofu dessert of some kind makes a delicious bedtime snack. There are tofu puddings, ice cream sandwiches, and frozen ice cream. Eat these snacks with a small number of almonds, walnuts, or filberts to balance out the elevation in blood sugar that will come from the sweetener in the dessert. 9. Turkey. No, I don't eat it, but my job is to bring you information, even if I never eat this food myself. Fact is, turkey is chock-full of tryptophan. It's also a good source of calcium. By the way, chicken is also a good source of tryptophan, as is most poultry. 10. Cereal. If you like whole grain cereal or granola, have a bowl! This makes a great evening snack. A study done at Cardiff University in Wales showed that people who ate a high fiber diet were able to fall asleep easier. Choose cereals that are high in fiber (5 grams per serving is a good amount). 11. Watermelon. During the hot summer months, this is one of the excellent foods for sleep. It's low in calories and is loaded with potassium, which may explain why it's an excellent food for your heart. It improves circulation and relieves tension in blood vessels. 12. Crackers. Just about any kind of cracker, including graham crackers, makes a good bedtime snack. Balance out the carbohydrate in the crackers with some nuts or cheese. Be careful not to eat too much that hour or two before you go to bed. Because if you're stuffed and bloated when you hit the sack...especially if you ate a big, high fat meal...you're going to have a hard time sleeping. If you often have acid reflux, heartburn, gas, and bloating from the foods you eat, you'll be surprised to know that properly formulated kiwifruit extract can help your digestion. So do your digestion a huge favor and click on that box below. You're going to discover—finally—real digestive relief. Nutritious foods in moderation...including these foods that help you sleep...are one of the keys to healthy, deep sleep and a better life. Bon appétit! Don't let stomach issues ruin a good night's sleep. Click here for better digestion.